Happy Sunday! It's been a relaxing day so far. My boyfriend mowed the yard while Madison and I supervised (LOL). Afterwards, we had breakfast and then watched "The Fighter" on Netflix. It was an interesting movie -- not one of my faves, but entertaining enough, I guess. Last night, we went to a birthday party for another set of twins. I'm happy to say that we have no more birthday parties to attend until the one we're throwing for Madison's first birthday. It's been a whirlwind of events, and we need a break! Well, no more parties, but we do have to buy a gift this afternoon for my older daughter's friend. Guess I will have to fit in a trip to the craft store at the same time ... tee hee. 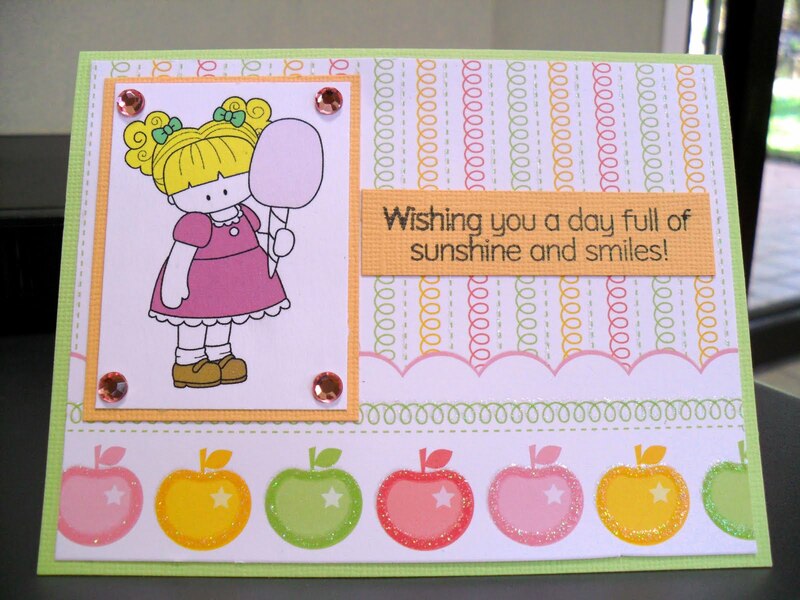 Anyway, here is one of the cards I made for the twins yesterday. I did actually make two of these. I used some glittery paper from a stack I've had for a while. 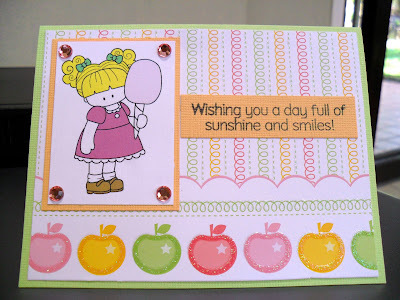 The image is Cotton Candy Leah from Whimsie Doodles. It was my first time doing digital coloring, and I have to say that I wasn't real pleased with the results. The shade of pink that printed was very different from the pink on the screen! I know my pink ink is running low, so I'm not sure if the result was because of that or something else. It was late at night, so I didn't want to fiddle with it anymore. I definitely like the look of hand coloring over digital coloring, but the nice thing is that you can easily change colors when going the digital route. Well, I'm going to squeeze in a little power nap before hitting the road. Hope you all enjoy the rest of your weekend. ALOHA! LOVE this! The apples are so stinkin cute! I got some plastic HK cookie cutters at Sanrio Pearlridge a couple of years ago. They came with a couple of tiny ones and I use them all the time to put HK cut outs on my pies! They had some rice molds too, but if you used em on cookie dough, it would imprint her face into the cookie! Lol, I haven't used those in a year or so, I think I should play with them one weekend! Hello Kitty Cookie Cutters = KAWAII !! !